Dr. E. Kofi Agorsah, comes from the Volta Region of Ghana in West Africa and professionally an Archaeologist (African and Caribbean Archaeology), Cultural Anthropologist by training. He is full professor of Black Studies and International Studies at Portland State University (PSU) and also the Chair of Black Studies Department (BST) and former Co-Chair of the Diversity Action Council (DAC) PSU, 2002-2004. He is the area Coordinator of African Studies in the International Studies and directs PSU’s African and Caribbean Studies Overseas programs. 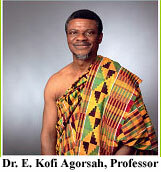 Kofi Agorsah obtained the Bachelor and Masters degrees in Archaeology at the University of Ghana, Legon in Accra, Ghana in 1971 and 1976 respectively, and the Ph.D. from the University of California, Los Angeles in 1983 and has since lectured at the University of Ghana (1983-87) as Lecturer/Senior Lecturer; at the University of the West Indies (UWI), Kingston, Jamaica as Senior Lecturer (1987-1992) and as Associate Professor at PSU (1992-96) and as full Professor since 1997. Prior to all these positions he had worked with the Ghana Museums and Monuments' Board rising from Assistant Keeper in 1973 to Keeper-in-charge of the Ghana National Museum at its headquarters in Accra in 1977 with additional responsibility for the Regional Museums at Ho, Cape Coast and Elmina. As Keeper of the Ghana National Museum, Kofi initiated educational programs aimed at involving elementary and high school in the Museum's educational activities and field projects and also organized programs of lectures, workshops as well as research expeditions, which brought various cultural institutions, such as The Arts Council of Ghana, the National Archives of Ghana, Regional cultural centers, together in a common effort to educate the general public on the heritage of Ghana. This co-operation made the establishment of cultural links with other West African countries, as documented in the Museum's development history in the late 1970's and early 1980's. He had the rare opportunity of establishing the Volta Regional Museum at the Volta regional capital of Ho and also supervised the reorganization of the West African Historical Museum at Cape Coast in the central Region of Ghana. In addition to the Museum's own committees, Kofi also represented the Museum and served on several local committees and boards including the Ghana Academy of Arts and Sciences and represented the Ghana Museums and Monument's Board at international conferences and meetings such as the Pan African Congress of Prehistory, The International Council of Museums (ICOM), The International Council of Museums, Monuments and sites (ICOMMOS), and Organization of Museums, Monuments and Sites of Africa (OMSA) and also served on the executive committees of the national Chapters of the international organizations. He was a member of the Ghana Academy of Arts and Science Committee on Culture and Documentation (1975-78) on which he played an active role in various ways in advising of the academy and the Museums and Monuments on government matters regarding cultural development, exchange and co-operation. Kofi's community involvement in Ghana also included weekly radio and television programs of public broadcast and lectures on aspects of African Traditional Cultures such as birth, drum language, names and naming, ceremonies, chieftaincy, traditional land rights, religious practices, festivals and festivities, traditional politics and death rites and proverbs to mention a few. These have now been published in a series called " African Foundations." He lectured in a variety of courses at the University of Ghana most of them covering anthropological as well as historical themes. Courses taught included: Introduction to Archaeology, A Survey of World Prehistory, Human Culture and Environment, Ethnoarchaeology, New World Cultures, African Iron Age and Field research and Social Science research methods. Kofi established the Volta Basin Archaeological Research Project (VBARP) while at the University of Ghana and is still actively a major contributor to research work in the West African region generally. The material for part of the project has now been written up and published by Edwin Mellen Press under the title of " Ethnoarchaeological Analysis of Human Functional Dynamics in the Volta Basin: Before and After the Akosombo Dam. (See CV for a list of other publications). At the University of the West Indies, Kofi taught courses at both undergraduate and graduate levels. These included Introduction to Archaeology, A survey of World Prehistory, Research Methods and Techniques in Archaeology, Environmental Archaeology (Human Culture & Environment), Caribbean Archaeology, Historical Archaeology, Historical Archaeology of the Americas and African Prehistory. He also guest-lectured on a monthly basis on African culture at the African-Caribbean Institute of Jamaica and also taught summer courses for the institute and pioneered the Archaeological research on Maroon heritage, the first in Caribbean Archaeology, started 1987 as part of the Archaeology program. Kofi's experience in Caribbean and New World studies started in 1983 when he jointly directed a field school in Jamaica for UWI and the African Caribbean Institute of Jamaica. Major excavations and ethnographic studies on Maroon heritage have been carried out since then. An inter-disciplinary symposium held in 1991 at the UWI in Jamaica with participants from the U.S.A., Mexico, and the Caribbean resulted in the 1994 edited book publication: Maroon Heritage: Archaeological, Ethnographic and Historical Perspectives. Following a similar symposium held at PSU in 1996 a volume "Freedom in Black History & Culture, was also published in 2001. The most significant aspect of these interdisciplinary publications has been the opportunity the symposia created for bringing the scholars from diverse fields together for a common goal. These projects have also generated linkages with institutions such as the Maryland Public Television, which created documentary on the Jamaican Maroons that includes the most recent findings of the research project, Center for Cultural Policy, New York, The African Burial Ground Project in New York formerly based at Howard University but now based at the College of William & Mary in Virginia; the Suriname National Museum, University of Suriname, Barbados Museum and Historical Society and also now with Portland State University. His research and educational projects have received support from various agencies such as the Volta River Authority, University of Ghana, Ghana Museums and Monument's Board, University of California in Los Angeles, The National Geographic Society, USA, The Wenner-Gren Foundation for Anthropological Research, The Jamaica National Heritage Trust, The University of the West Indies, and Center for Field Research and Earthwatch, Boston. The multi-disciplinary projects have offered opportunities for faculty, students and the general public, with diverse backgrounds and interests. Interest in research on Maroon heritage started with Kofi’s very first trip to the Caribbean in 1983. The opportunity to return to Jamaica after his doctoral work provided further opportunity to launch the research and teaching programs at the University of the West Indies (UWI). Several years of field work in Jamaica point to the need to extend the study to other similar communities of the New World and the Maroons of Suriname obviously appeared to be one of the most attractive communities with a rich history and heritage of freedom fighting. Since the launching of the archaeological research on Maroon site in Suriname, with the support of the National Geographic Society, USA, many documented sites have been visited and some explored and surveyed while test excavation and full-scale excavations have been undertaken with very good results. Participation of the Chiefs, elders and other Maroons, both male and female, have greatly laid a very good foundation and prepared the way for the required collaborative research for the formation and transformation of Maroon settlements and sites. Most recent scholarly awards include: The PSU College of Liberal Arts (CLAS), award for Outstanding Teacher of the year (2002); Branford Price Millar award for Faculty Excellence (2002) and the CLAS award for Outstanding Teacher (2004), the Fulbright Scholars Award 2007-8 and National Science Foundation (NSF) Grant for Archaeological Research (2009). For more information www.pdx.edu/blackstudies or www.maroonheritage.pdx.edu. See CV.